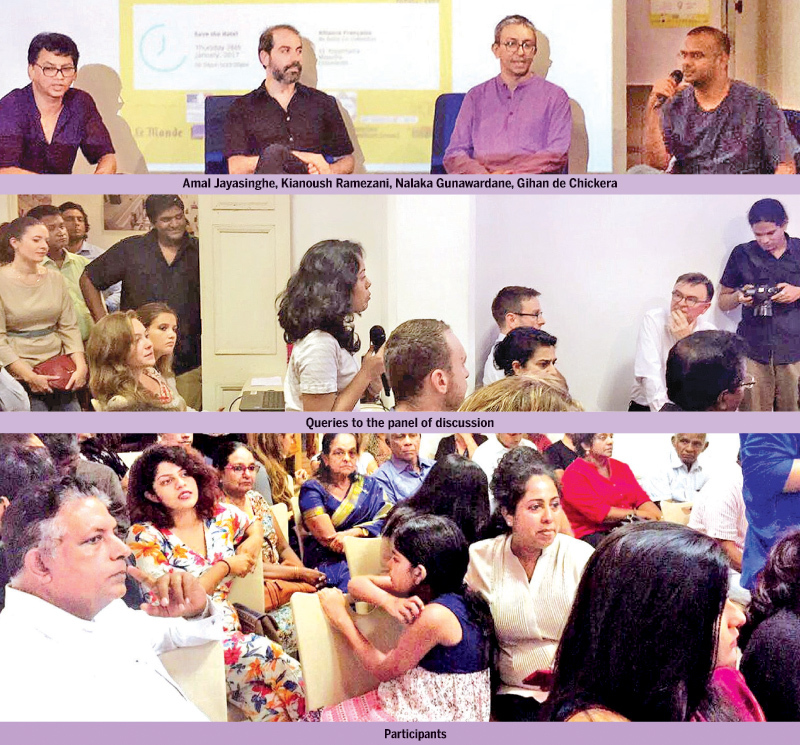 The Alliance Française de Kotte in Colombo hosted a panel discussion, exhibition, and concert last Thursday evening as part of “The Night of Ideas,” an international event that took place at over 100 Alliance Françaises across the world. The discussion, moderated by Agence France Presse (AFP) bureau chief Amal Jayasinghe featured Iranian artist and author Kianoush Ramezani, known simply as Kianoush, journalist Nalaka Gunawardene, and political cartoonist Gihan de Chickera. These four were tasked with conducting an open conversation on how to ensure, and also responsibly regulate, freedom of expression across the media landscape, from mainstream print papers to websites to social media. This topic, though important to every country, is especially significant in Sri Lanka, as the island is just emerging from years of government-imposed censorship and the suppression and murder of journalists. The debate, which took the form of a dialogue between the audience and the panelists, was wide ranging, to say the least: topics included how to regulate free speech and hate speech, the role of cartoons in combating political and social oppression, and how to create media literacy. While the panelists agreed that free speech should be considered a human right, or fundamental right, their conversation posed more questions than it provided answers about the role of the media in society. 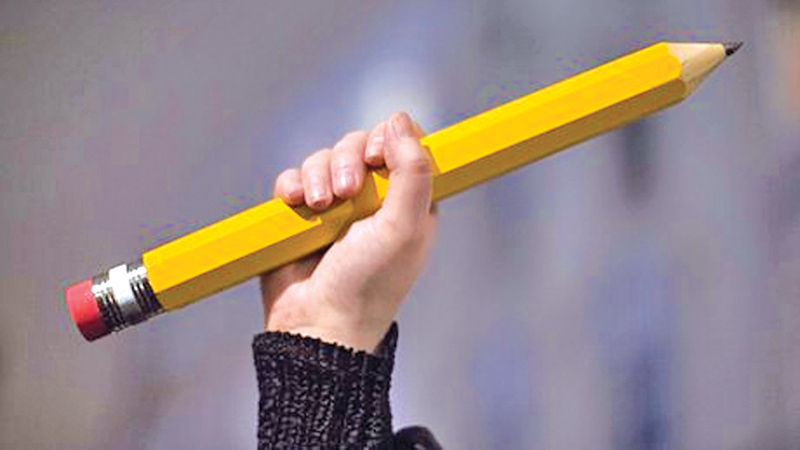 A crucial question the participants wrestled with was whether or not there should be any topics, groups, or individuals who are off-limits from satire, commentary, or critique. Gunawardene related that cartoonists and journalists almost never criticised or mocked former Defence Secretary Gotabhaya Rajapaksa during his time in power. “I called him he who shall not be drawn. There was such fear where his name was concerned, that nobody, not even the most daring cartoonists, actually drew him,” he said, before asking if there is anyone who is forbidden from being critiqued today. Though de Chickera acknowledged that media freedom has expanded since 2015, he did say that the main group that remains off-limits from satire is the clergy. “The clergy are sometimes dangerous to touch, but I would not say that we would not dare touch them. Currently we can lampoon clergy who are directly involved in the public sphere and who are seen as politicians and leaders.” “But to use a clergyman of any religion as a symbol to target that particular religion, I think there’s still a bit of a restriction in that department,” he said. “In this way, we believe that we can be the voice of those who do not have a voice or cannot express their voice, for those who cannot really share their ideas. After the Charlie Hebdo attack, we are trying to work harder to show that cartooning is not a mean thing, it’s a necessity,” he said. He added that the more people read and understand cartoons, the more they understand complicated sociopolitical situations. It follows that, for Kianoush, everey group, no matter how marginalised or powerless, is fair game for satire. De Chickera, for his part, pushed back on this equal-opportunity theory of satire and critique, as he noted that he tried in his cartoons to criticise the powerful as opposed to the destitute. “I try to draw cartoons from a rights’ perspective, so that they would enhance or support the rights of a group whose rights are being denied. This is as opposed to using my expression to deny certain people rights, or hit out at people who are facing discrimination in society,” he said. For Kianoush, however, any and all rules put undue limits on someone’s freedom of expression. “If we as cartoonists want to reach some goal, we may provoke, we may even use blasphemy if we want to point out something that is wrong...I don’t believe in any sort of constitutional limitation to any sort of activism,” he said. In his view, in fact, cartoons and critique can benefit governments and authorities and lead them to improve: “We hope that the authorities that make us suffer may consider or reconsider their policies, and in this way maybe we can reach together to some sort of democracy,” he said. Indeed, he argued for building trust between the state, the population, journalists, and cartoonists, which he hoped would allow for better understanding of society’s problems. “Can we really trust the state to regulate hate speech and stop at that, or will it encroach on other rights as well? Where do you draw the line, especially dealing with social media,” he asked. The speakers agreed that the question of regulating fake news is important, albeit fraught, as the neither the government nor the media itself should be in charge of this regulation. J.C. Weliamuna, one of the evening’s chief guests, stumped for an independent regulator that would act impartially. It is of course a lot easier to regulate the mainstream print media than it is to control what gets published on the Internet. That being said, the democratisation of content that the Internet provides can be an incredibly powerful weapon, as everyone has access to and can create their own material. Social media provides myriad challenges for regulation and abuses, but every speaker agreed that trying to control what goes on the web is a fool’s errand, especially when it comes to memes. “We have no other choice than enjoying them, or maybe disliking some of them. Nobody can put any rules on them. They’re just available, for everyone, and free. We need to face them,” said Kianoush. Despite these difficulties in policing not just memes, but all sorts of web content, Gunawardene noted the importance of at least trying to stem some of the more deleterious material. “Technically, it’s very difficult, next to impossible, to selectively block anything or selectively regulate anything on social media,” he said, while adding that the government is looking to regulate hate speech that shows up online and in the mainstream media. 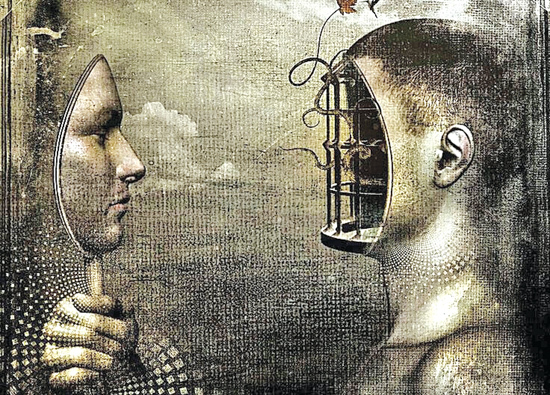 As Sri Lanka experiences growing pains from moving away from censorship and self-censorship, it is clear that it is time for the media to assume a role wherein it educates people and properly shares information. For Kianoush, having people understand politics through cartoons and humour is of the utmost importance. De Chickera, for his part, noted the importance that many Sri Lankans vote, but not many know their rights. “People are very aware of their voting rights, not very aware of their citizen rights. So as a cartoonist, you see your rights being violated between elections, and you try to create awareness of that in your work,” he said. “We have to basically, on the one hand, increase everyone’s media literacy skills so that everyone can at least have the basic ability to discern and question what is coming to us from a multitude of sources these days,” Gunawardene said.